Dry January! Why we need to drink more water! 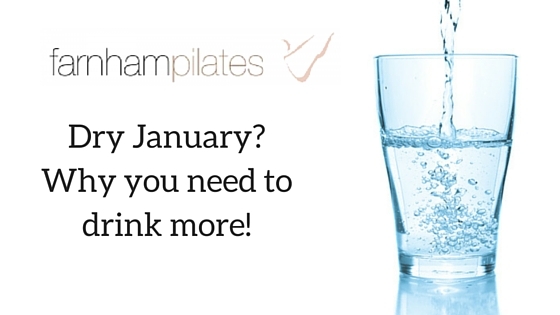 Are you doing dry January? Whether you are trying it or not this month, it is a good time to check if you are drinking enough water. Drinking more water can curb appetite and sometimes hunger can be thirst so try a drink before eating. Tip – did you know – Water is an absolutely essential thing for weight loss, staying healthy and looking after your body! It can be hard to keep on top of the old 8-glasses-a-day rule so here are 12 ways I think are a great way to keep your water intake up. 1) Don’t allow yourself a diet fizzy drink until you’ve drunk 2 glasses of water. 2) Have a glass of water every time you do something transitional – ie, sit down at your desk, get home from work, when you first wake up. 3) Keep a bottle in your handbag and take it everywhere you go – fill it up along the way. 4) When you go to fill up your bottle or glass, down it – and then fill up again! No sipping over time, just get hydrated then and there on the spot and you’ll feel the benefit immediately. 5) Freeze slices of lemon, lime or orange and use them instead of ice-cubes. So refreshing! 6) If you must drink a rare orange or apple juice, just fill it half way and fill the rest with water. 7) Take a two litre bottle to work and aim to drink it all by the end of the day. Leaving it on your desk will reduce time spent away from working and will be a constant reminder for you to drink it up. 8) Drink two full glasses of water at each meal – one before and one after. You could drink one before you have a snack too so you don’t eat as much. Sometimes when you think you’re hungry, you’re actually just dehydrated! 9) Put reminders in your phone calendar! Every three hours would be good and you’ll remember throughout the day rather than remembering at night and trying to play catch up all at once. 10) It doesn’t all have to be cold! Drinking hot water and lemon or ginger is lovely. Make sure it’s caffeine-free though as caffeine actually robs you of water! Herbal teas are great instead of caffeine like mint tea, liquorice. I’ve become a fan of Three Tulsi. 11) When drinking alcohol have 1 glass of water to 1 wine/ bubbly etc you will feel better in the morning. So drink up – bottoms up! If you take just one of these tips away, you’ll be on the right track to getting your 8 a day and you’ll definitely drink more water.